The Oakland Raiders announced on Wednesday that they have re-signed restricted free agent Jalen Richard. The terms of the contract were not released. Richard originally signed with the Raiders as an undrafted free agent out of Southern Mississippi in 2016 and is coming off a career season. The 25-year-old only carried the ball 55 times for 259 yards and one touchdown in 2018, but he was tied for the team lead with 68 receptions to go along with 607 receiving yards. Overall in his three seasons with the team, Richard has 194 carries for 1,02 yards, good for 5.3 yards per carry while adding three rushing touchdowns. He also has 124 total receptions for 1,057 yards and three receiving touchdowns. 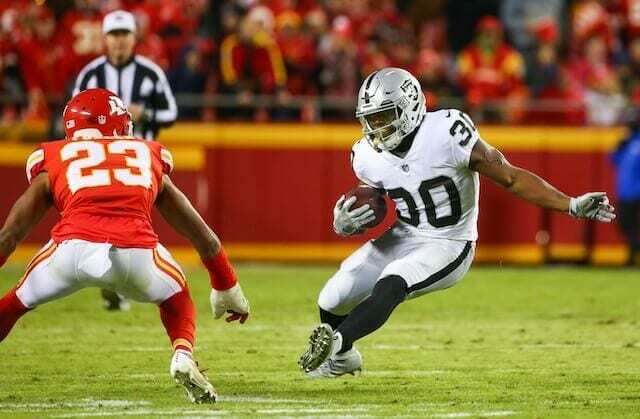 Richard will likely serve as the Raiders’ third-down running back once again in 2019 to provide quarterback Derek Carr as a safety blanket. The team recently signed free agent running back Isaiah Crowell, so he may be handling first and second-down duties. With the NFL Draft just around the corner, the Raiders have been linked to some of the top running backs available. It will be interesting to see if they spend a first-round pick on one of them or if they are content with the tandem of Crowell and Richard for the 2019 season.